Just a quick post tonight. 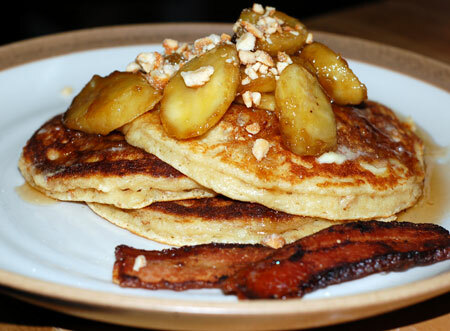 We decided to do breakfast for dinner tonight, and I immediately turned to my old stand-by, praline ricotta pancakes. To make things a bit easier on myself, though, this time I used some honey-roasted cashews instead of home-made praline; a brainstorm that worked out nicely, if I do say so myself. The cashews gave it a slightly tropical flair, so I also sauteed some bananas with butter and brown sugar. A very successful variation of a great recipe, and worth remembering. Rather than using my usual nonstick skillet to cook these pancakes, tonight I decided to test-drive my new Lodge griddle (a birthday present from my sweetie, along with a really great Kitchenaid blender). It definitely has a bit of a learning curve: less surface area than my nonstick, and it heats differently. I love my cast-iron skillets, though, so I’m sure this one will come into its own in no time. I have a hunch it will make really stellar grilled cheese sandwiches and tuna melts, not to mention steaks. In the meantime, I just need to find a practical way to wash and store it without breaking my stovetop, sink, or foot in the process.